A high degree of expertise is essential for effective cleaning of conservatory roofs and windows, and Sparkling View can meet this need. With more than 10 years’ experience in window cleaning, and customers spread throughout East Berkshire, our highly-trained team is available to fulfill your requirements. In addition to external glass, our standard service includes cleaning of frames, cresting and finial. Any traces of moss or algae will be removed from your conservatory roof and, if required, we can clear and clean your guttering, too. 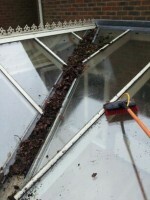 Basic price for conservatory roof cleaning starts from our minimum charge of £40, which covers the first eight panels. Cleaning of additional panels is priced at £3.50 each. 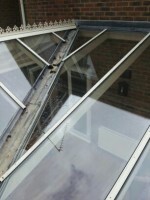 We have specialised conservatory ladders available for use in situations where it would otherwise be impossible to clean your roof. 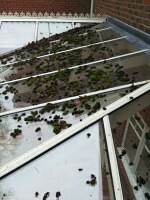 They are generally suitable to use when previous attempts have failed and resulted in damage to the conservatory. A Premium Service is also offered by Sparkling View at additional cost. 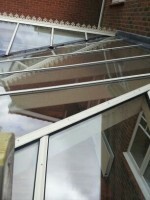 We will be happy to provide a quotation for this service, which brings UPVC components closer to their former glory. Most ingrained stains and discolouring can be removed, using trade compounds. Our conservatory roof cleaning service is available in Ascot SL5, Bracknell RG12 and RG42, Crowthorne RG45, Maidenhead SL6, Wokingham RG41, RG40. Click on capital AA letters until text size has reached comfortable level. I must say that Sparkling View has really renewed my faith in window cleaners. They advise you by phone or text of their anticipated arrival time and when they get to you they do a professional, first class job. It's fair to say I'm very satisfied customer. At last I have found a window cleaning team that looks after my property as though it belonged to them. Great stuff! In the past we've had pretty good window cleaners, but that's all they did - cleaned windows! Sparkling View team cleans window frames, sills and front door as a part of service. So once they've been, the improvement in the appearance of our house is very noticeable. A lovely conservatory at our home in Ascot is a real pride and joy for me and my family. Although we have never been happy when our conservatory roof has been worked on by previous window cleaners, it's too big job to do ourselves. Now, it's never looked so clean. This is thanks to Sparkling View, which has invested in special equipment and have know-how to do the job carefully and safely. As far as my wife and I are concerned, we find the range of additional services offered to be a great advantage. Instead of having to use relatively unskilled people who we don't know to clear and clean our gutters at our home in Bracknell, we're more than happy to pay what we have found to be quite reasonable extra charges for reliable additional work carried out by Sparkling View. Their list of services and prices are well worth consideration.